Esqueleto Explosivo is a Thunderkick-powered slot which can be played on mobile/tablet devices. Based on the Mexican Day of the Dead, this game benefits from exploding wilds and dropping symbols. When you have a winning combination, contributing symbols disappear to be replace by new ones – the multiplier goes up to a whopping 32x for consecutive wins. It also has an Explosivo wild which blows up symbols near it to give you another chance of winning. For those unfamiliar with the Spanish language, Esqueleto Explosivo translates as ‘exploding skeletons’ and what better name could there be for an online slot? 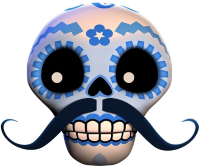 It’s developed by a company called Thunderkick Games and the theme is the Mexican holiday ‘Day Of The Dead’. It’s a time when Mexicans celebrate and remember their dead relatives and it has absolutely nothing to do with zombies. Esqueleto Explosivo plays out over five reels and seventeen fixed paylines. The action all takes place in a town square where Enrico Mortis and his mariachi band The Boners are playing, surrounded by candles and photographs of their dead family members. There are only five main symbols and they are the different band members represented by coloured skulls – light blue, yellow, blue, green and pink. Each time a win is landed, the band will sing part of a Mexican song (this is better than it sounds). The only special symbol is the wild and this is the yellow skull adorned with a massive pair of sunglasses. Thunderkick calls this feature ‘dropping symbols’ but it’s similar to the ‘cascading symbols’ used by some other slots developers. Each time you land a win, those symbols involved will explode and be replaced by more dropping down from above, providing you with another chance of winning. Each consecutive win will increase the multiplier for that amount as follows – 1x, 2x,4x, 8x, 18x and 32x. Lots of wins in a row obviously increases the multiplier quickly and it also generates a succession of songs. The yellow symbol is more than just a standard wild; it substitutes for all other symbols but the big news is that it will explode all eight symbols next to it whenever it appears. This will also increase the multiplier in a similar manner to that described above. There’s very little player interactivity here so we can’t offer much but we would advise keeping the sound on for the full Mexican effect. This is a brilliant slot and we’d now like to check out Thunderkick’s other games. The graphics and animations are absolutely top notch and the sound complements the gaming really well. Hola senoritas and ombres are you ready for fiesta? Do you wanna see exploding skeletons? Sound awful maybe, well it is not awful but very fun and beautiful game from Thunderkick. It’s been a really long time since I last time played this game and I can remember my play session but I do remember that I had fun and I remember some wins increased by multiplier. 5 reels, 17 paylines. Theme for this game is Mexican holiday Day of the Death and you could join the skeleton mariachi band here. They look very cute actually and come as red, blue, pink, yellow colors. I don’t like background sound, for some reason it is irritating to my ear but it’s not the problem, turn off the sound if you don’t like it and enjoy this game which will keep you entertained. I promise that. What is really funny to me is skeletons singing when you have winning combination and what is super nice are multiplier that goes up to 32x, x1, x2, x4, 16 or 32 Mucho Multipliers is waiting for you to be won. It is about skulls, exploding skulls and new skull dropping down. Yellow skull wearing the sunglasses is the wild or Explosivo Wild. Dropping symbols are common for Thunderkick and I like very much their latest releases. What I don’t like, is that I heard one of our members he cannot recognize games anymore but still those are insinuations as we can’t really know it the way that game play really change. Explosivo Wild will blow 8 closest symbols for your new chance to win and in order to increase the multiplier. As long you are winning dropping symbols will keep coming down in order to create winning combinations and if you are lucky, you can have a great time while playing and watching dropping and exploding skulls. This is a must try slot! Esqueleto Explosivo certainly is one of the most comical video slots I’ve ever seen at an online casino. My Spanish isn’t too great but judging from the name it means something like ‘Explosive Skulls’, which perfectly makes sense if you take a look at the skull symbols, exploding features and Mexican phrases being spoken out after each win. Thunderkick knows how to make compelling video slots and Esqueleto Explosivo isn’t any different when we take a look at their gaming selection. I had the chance to play this game a few months ago and did regret it eventually due to my bad session. Esqueleto Explosivo contains 5-reels, 3-rows and 17-paylines. Playing this game is possible for only 10 cents per spin. I played it on 1 euro bets when I gave this funny looking slot a try. Underneath the rows several skeletons are positioned, and the symbols are basically skulls in different colors. After each win the skulls that form a winning combination explode, while a re-spin follows with each consecutive win. However, that’s not all though because there is also a multiplier going from 1x, 2x, 4x, 8x, 16x all the way up to 32x. I found it difficult though to get consecutive wins. There is also a wild symbol, which is the yellow skull. The positive thing about that symbol is that it will guarantee a re-spin since all immediate surrounding symbols will explode. There is no bonus game or free spins to be earned in Esqueleto Explosivo. Only problem is that it’s hard to get a decent win without involving the multiplier. The highest paying symbol for instance only pays 2.5x bet for a 5oak. I don’t think a full screen of the same symbol is even possible, so basically I’m not even sure what to look forward to. I had one short session and lost 120 euros quite quickly. My wins didn’t exceed 22x bet and that can’t be what I’m aiming for. It’s a shame though, because with a better paytable I really think this game would have been a hit among slots fans. When Thunderkick games arrived, most of them they were offered as a free spins that many Netent casinos were giving as a free spins, just to try those games. Honestly I am not big fan of these games, just because I think that the winnings from these slots are too small, but I know someone who is playing these games and have really good luck on them. The first time I played this slot was in Casumo Casino which they offered 10 free spins, well 10 free spins, with bet of 0.10 euros per spin is to little so that day I won around 0.80 euros. I wanted to try this game with my money so deposited 30 euros and began with my playing, just to see, what this game has to offer. For me nothing special from this game. The theme about Esqueleto Explosivo is all about the Skulls, who are Mariachi and playing and singing all the time. The Wild symbol in this game is the Golden Skull, which will blow 8 other skulls around him and that way the other Skulls appear and making you a winning line or not. From those 30 euros my biggest win was around 20 euros, so no I am not satisfied with this game nor should I pay much more attention, giving chance to see, what this game can do. I don’t like this game just because there are no free spins neither bonus rounds, so the only good thing about it, it’s the fact that if you get lucky and matching Skulls on reels and they explode, the winning combination can award you multiplier X 32 which is really big amount of winnings, but if you managed to catch them, which I never trigger that multiplier. So far I am done with this game, because I played it few more times and didn’t give me anything decent. We’ll try it, you might be luckier then I was. It took me about 5 minutes to write the title of this game, no just kidding but really it took me 3 times longer than normal. Esqueleto Explosivo probably translated as exploding skeletons. That’s kinda violent but then again casinos are for adults. As far as I know this game is available at Casumo and it was the only casino where I played this game. Personally I find Thunderkick games very strange and most of them had low paytable but not this one is not the case. It was a few months ago that Casumo offered 5 free spins for this game, at the time my desktop was broken (unavailable for a few days) and I had to use my laptop from the stone age. So I logged in and claimed the free spins. 5 free spins wouldn’t do much so I thought. Fortunately I was wrong and those 5 free spins gave me a winning over 12 euro. Seeing that I was stunned, for just 5 free spins. I have other games from the same software and Esqueleto Explosivo is one of the best games (and Sunny Scoop). I think this game is as good as Energoonz powered by PlayNgo but only the free fall bonus round has the same game play as Energoonz’s main game, that’s how I won that big with just 1 spin (each win will be multiplied). It’s a pity that the bonus round could be only triggered if a cone is filled with one kind of ice cream AND if the wheel stop at the free fall symbol. Tried this game a few weeks ago and surprisingly I manage to get a few bonus rounds within half an hour, which is happens not very much at this game but when it happens then it will happened big time too (at least that’s my experience so far). I recommend this game only if you have ice cream in your freezer because man this game just make you hungry for ice cream especially the one with chocolate in it! Ladies be careful playing this game though (just kidding). If you’re wondering what the name of the game means, it means something like Escalated Explosions. Which language it is, I’m no expert, but the game is set within a Mexican locality, as I’ve read it. Yeah, probably Mexican. Amongst all of Thunderkick games available now, Esqueleto Explosivo is the most beautifully presented game, and in 3D too. Colours are vibrant, scenes are very nicely rendered, icons are colourful lively skulls, and the music is catchy and lively! I love the chanting from those skulls, but I do not know what they are saying and singing, most of them sounding like exclamations to me. Yes, I love the graphics and music, even though the colour variations between the different skulls could be made slightly more distinct for easier viewing. No star down/up. Basically a drop-down game, as in Gonzo’s Quest as so on, but utilising skull icons instead, and having 17 paylines. Weird icons, but entertaining nonetheless! The wild symbol is the explosive yellow bespectacled skull, which doesn’t pay for itself, but will blow away 8 symbols closest to it, for new skulls to drop down. The Pink skull is the highest paying symbol at 2.5 x bet. Yes, only 2.5 x bet for 5 of them! The next one, the Green skull, paying 1.4 x bet. Gees, wondering how big wins can be had with such very low values! Well, perhaps the answer lies in the win multiplier that increases with each win, up to a maximum of x 32. Sounds good, but does it really pay good? Yet to see. 1 star down. Unlike Gonzo’s Quest, for example, Esqueleto Explosivo does not have any other feature game. No free spins, no bonus game, no randomly activated anything either. Just a simple straightforward playing game, as in most other Thunderkick games. Like it or don’t, as simple as that. 2 stars down. Trying to rate a game that plays only one way, without offering any free spins or bonus games can be very tricky indeed, because it cannot be compared apple to apple with another game which has more features to offer. Esqueleto Explosivo is actually a very nice and fun game to play. I enjoy the animations. I enjoy the chanting that I cannot understand. I love the overall lively music and sound effects that it present. Yes, I’ve got wins with the x 32 multiplier, the best being 131 x bet. Yes, I’ve made several small wins too. But after a while, I find myself longing for something more exciting. At least Gonzo’s Quest has a free fall feature game, which is actually a free spins game, and that in itself is exciting enough. Getting something extra, and with a chance of getting bigger wins than what could be won from the base game. This is sadly lacking in Esqueleto Explosivo. Nonetheless, it is a game that I could play again and again, making some small wins once in a while, despite the not-so-good overall payouts. This game could definitely be better. In the future I hope.